Kerastase Oleo Complexe The Imperial is a product from a series of hair oils issued by the brand. This one is specific because it contains an exceptionally strong concentration of natural hair care oils. Everything is done to mainly take care of colour-treated hair, which is very easy to harm. All women whose hair is dry, unruly and in desperate need of care, will appreciate the effects. Oil comes in a neat, very nice and somewhat heavy glass container. It has a delicate, powder pink colour. The bottle is equipped with a large pump, which facilitates application and works flawlessly. Oil Kerastase Oleo Complexe The Imperial has capacity of 100 ml, but because of the variety of applications, it runs out very quickly. 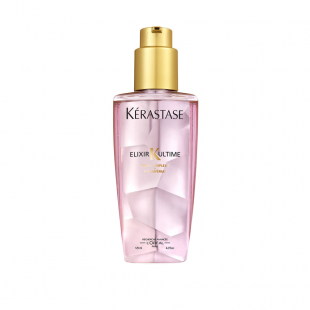 Kerastase Elixir Ultime – even though it is designed for colour-treated hair – the producer defines it as a general illuminating and rejuvenating product. The quality of the cosmetic is undoubtedly affected by oil content. Corn oil – shows nutritional and regenerating properties. Adds resilience to the strands and protects them against free radicals due to the high content of vitamin E.
Argan oil – is almost as if it was created for damaged hair due to styling treatments, including dyeing. Not only it will protect strands from damage, but also deeply regenerate them. Additionally, it perfectly polishes hair, providing resilience and nourishment to hair ends. Camellia oil – also known as tea tree oil – is valued mainly for nourishing hair deeply and leaving it smooth. Enhances its brilliance, increases resilience and conditions the hair, additionally, soothes any irritation. Pracaxi oil – protects hair very well and prevents frizz. Moisturises dry strands and contains a UV filter. Kerastase Oleo Complexe The Imperial has a pleasant, delicate scent that remains on our hair after application. It has rather runny consistency, but is also very efficient and easy to apply on the wisps.